Weightless(official trailer)2018 from WEIGHTLESS on Vimeo. 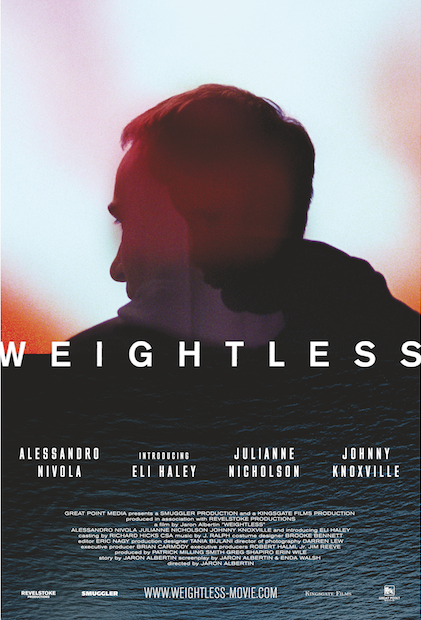 Alessandro Nivola, Julianne Nicholson and Johnny Knoxville star in this haunting drama of a man, living on the margins of society, who suddenly finds himself responsible for a ten year-old son whom he hasn’t seen since infancy. An alienated loner who can barely take care of himself, he struggles to forge a relationship with this lonely, at-risk child. Canadian director Jaron Albertin is a celebrated talent in the video and commercial world. In 2015, year he won the most prestigious award for advertising, the Palm d’Or at Cannes for his directorial work on Under Armour’sI Will What I Want campaign with Gisele Bündchen. His other numerous accolades include a Bronze Cannes Lion and additional Cannes Lion Shortlist, a prestigious D&AD Yellow Pencil (and additional Pencil nomination), Gold and Bronze Clio Awards, an AICP Award, and the PLUG Award for Music Video of the Year.